Profusely illustrated with plans, photographs, drawings and tables, the book traces the spread of Merton’s influence in England, Scotland and Normandy, through the setting up Augustinian communities at Taunton, Plympton, Canterbury, Bodmin, Edinburgh, Cirencester, St Lô, Dover and Christchurch within 33 years of the foundation of Merton Priory beside the Wandle. Lionel has been studying all aspects of Merton Priory for over 50 years, and shares some of the results of his studies in this excellent book. mission stations serving the surrounding area. jealously guarded to prevent loss of income. applied for higher purposes, for the good of the owners’ souls. that time, could not serve the community. to serve their own community rather than the parishes dependent upon them. as the story of Merton’s daughter houses is revealed. the medieval period when the secular colleges suffered a poor ‘press’. maintained themselves from the outset. Huntingdon in 1114 to become the first prior of Merton. moat enclosed the Great Hall,2 the castle motte and the college. fish pond or vivary was within this parish. and finally appealed to the Prior of Merton to recall him to the place he loved. new precinct and the mill. Building beside gatehouse of Taunton Priory centred on St James (see map). 1 J Collinson History….of Somerset (1791) iii 231. (1969) ‘The Life of Guy of Merton…’ p 257. 5 Ibid. Ch xii p 259. 6 Ibid. Ch x p 259. The building above, which now houses the County Cricket Club museum. The vivary is an open space facility to the south. canons from Aldgate (London) and Merton3 to occupy the Plympton buildings. to St Peter and St Paul, the same dedication as at Taunton. chapter house of the priory on 1 October 1137.
prior of holy memory”.6 Geoffrey’s wish was granted. 1 W Dugdale Monasticon Anglicanum (1846) vi 51a. 2 J Chandler (edit.) Leland’s Itinerary (1993) p 111. 3 J C Dickinson Origins of the Austin Canons…(1950) p 117 n 10. 4 G. Oliver Monasticon Diocesis Exoniensis (1846) p 131. 1117. The correct year but the wrong festival. Rebuilt building with priory stone. Trace of watercourse. canons from Merton to assist his foundation. extensive complex of buildings in the precincts c.1155. education was an important function. and the cloister arcade consisted of Purbeck marble columns. about 1160.4 This shows an apsed church with crossing and western towers. apples from their orchard each year in the second week of September. to build the ‘new work’ at Dover (see p 24). 4 Trinity College Cambridge MS R.17.1. was still alive. Tempers rose and Algar had to intervene to prevent bloodshed. the canons of Exeter insisted that the funeral should take place in the cathedral. chose Plympton for his own burial. style, similar to Merton, with the Lady Chapel added later to the east end. all possessions on 27 February 1539.
but Anselm of Laon (d. 1117). Peter Abelard was a contempory of Algar at Laon. p 253–9, Epistola fo. 95v Ch 13. 3 D Gilbert The Parochial History of Cornwall Vol.1 (1838) p 73. 4 M L Colker Ibid. p 253. 5 F Barlow Ibid p 249. 6 M L Colker Ibid p 254. 7 C Henderson Essays in Cornish History (1935) pp 222 & 225. 8. A Heales The Records of Merton Priory (1898) pp 311, 312. Fragments in garden of Priory House and in museum. Monument to prior Vyvyan (d.1533) now in parish church. brother-in-law, and he learnt the importance of centralised control to rule a country. to produce educated men to run his newly formed civil service. Norman settlers but in the Central Highlands (Scotia) he chose the existing thanes. In 1114 David married Matilda, daughter of Earl Waltheof and Judith his wife. became one of Earl David’s chaplains in 1120 and later his confessor. Gilbert, founder of Merton Priory. King Malcolm granted the church (or priory) of Great Paxton to Holyrood. year on 17 November 1151.
and the church contained a royal burial vault. use by the royal family. 3 A virgate could vary between 10 and 30 acres, but was usually about 25 acres. Scot. Hist. Rev. Vol 14 (1916/7) p 371/2. to the Historia Fundationis of Holyrood, Alwin was still a canon of Merton in 1128. (Book of Old Edinburgh Club III (1916) p 64). 6 ‘Holyrood Chronicle’ in Scot. Hist. Soc. No 30 (1938) p 121. Alwin. A Heales The Records of Merton Priory (1898) p 16. Ruins of nave include a Norman doorway and arcading. for an ambitious royal foundation on the old. Serlo died on 30 January 1147. 10 0 50 100 ft.
5 0 10 20 30 m.
reason he gave the manor of Dunstable to that priory. 3 J C Dickinson Origins of the Austin Canons…(1950) p 119. 4 E J Kealey Roger of Salisbury: Viceroy of England (1972) Calif. Univ. p 121. 5 College of Heralds Arundel MS 28 “et dominus Serlo, ecclesie Salesberiensis olim decanus”. that Serlo was abbot in 1117. 7 Chronica. Roger of Hoveden (1869) Vol 2 p 101. 10 Both Holyrood and Cirencester abbeys were royal foundations. 11 J Chandler (edit.) Leland’s Itinerary (1993) p 167. There are buried foundations, and some of the precinct walls exist. Norman Spital Gate north east of park. Merton.He also adorned the church of St Lô (see p 5). as “our” founder, suggesting that Theodoric had been at Merton. 3 M L Colker ‘Latin texts concerning Gilbert …’ in Studia Monastica Vol.12 (1970) p 265. Rebuilt church may contain parts (see p 34). the privileges of a royal castle, not subject to the bishop’s jurisdiction. came.3 The archbishop procured workmen and skilled masons from Canterbury. was to be dedicated to St Mary and St Martin. the new church in order to follow the rule of St Augustine. ‘new work’ at Dover but allowed the Canterbury monks to occupy the monastery. finally became a dependency of Canterbury, but the relationship was never happy. 1 W Dugdale Monasticon Anglicanum (1846) iv p 538; Domesday Book 1.1b.2. 2 W Kennett Parochial Antiquities (1695) p 93; C R Haines Dover Priory (1930) p 62. 5 Although one record says that a canon was slain. referring to the rivers now known as the Stour and Avon. and a piece of the table at which the Last Supper had been celebrated. their prebends were left unfilled, and more of the revenue accrued to Flambard. 1100 Henry I, the new king, arrested him and sent him to the Tower of London. endowed the minster with lands in the Isle of Wight. High Altar was consecrated in 1135. Winchester named Hilary was made dean. prebendal churches. Some had even hired chaplains to fulfil parish duties. conventual buildings – cloisters, dormitory, kitchen, refectory, etc. two bells cast in 1370 – St Augustine and All Saints. Much of the Norman work remains. Norman crypt under each transept. 10 0 50 100 150 ft.
2 Victoria County History Hants. I p 476. Anglicanum (1846) vi pt.1 p 303. 950–1200 Oxford University Committee for Archaeology, Monograph No 17 (1988) p 50. 8 W Dugdale op.cit. vi p 304. 9 Dictionary of National Biography VII p 240. 10 A Clapham English Romanesque Architecture after the Conquest (1930) ii p 59n. Prof.
would know the prior Geoffrey, a friend of Merton. 12 Victoria County History Hants. II p 153.
move to Newnham just outside the town about 1180.
should be returned to a grange and staffed by a single canon. become a grange of Merton. 2. Victoria County History, Bedfordshire. i p 377–9. 3. British Library Harl MS 3656 fo.71; translation in Victoria County History, Bedfordshire ii p 154. 4. A Heales The Records of Merton Priory (1898) pp l37–8 and Appendix xlix. 5. Register Collegii Exoniensis (ed. C W Bouse) p 321.
attempted to establish Dover – the key to England. charters set out the requirement for a song school and a grammar school. Merton worked with the priory to found his college at Oxford in 1264.
were the earliest hospital foundations following the Order of St Augustine. 1 F Barlow The English Church 1066–1154 (1979) p 233. 2 D Knowles The Historian and Character (1963) p 194.
had vowed to be the first to enter St Lô but had been killed the day before. Augustinian abbey founded by Merton canons 812 years earlier. Norman monastic churches give some idea of their importance. 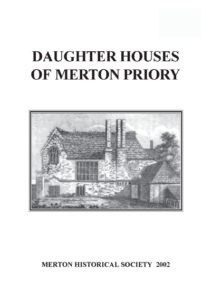 This entry was posted in Publications, Booklets, Publications and tagged in merton, merton priory.